* Also the number one preferred skill I listed in my earlier post. So you’ve heard it from at least two different sources now. ** ASP.net is really a framework that you’d develop in using Visual Basic.net or C#, so I’m not sure it’s really in the same category as the other skills mentioned in their article. *** While you can certainly develop GIS applications using Visual Basic.net, most GIS developers use C#. So if you’re just learning to program, learn C#. If you’re already well entrenched in Visual Basic from years of experience with prior versions (like me), then keep developing in VB.net unless your lack of C# experience starts to interfere with employment prospects. I read an interesting recent article that discussed a digital “autopsy” of the social network Friendster. Friendster was the grandfather of the social network, preceding both MySpace and Facebook. At its peak it had over 100 million users and a $30 million buyout offer from Google (which they turned down). However, following some technical problems and a site redesign in 2009, the network suffered a catastrophic loss of traffic as users moved to other networks like Facebook. The first factor is a cost-benefit ratio: when the costs, in terms of time and effort exerted by being a member of the social network are greater than the benefits obtained, the conditions are set for users to leave. This is where the network’s topology is important. If a huge number of people in the network have only two friends, then when one of them leaves, the other is left alone on the network and will likely exit as well. This results in a cascade of users leaving the network. However, if people have many friends on the network (many connections), the loss of a single friend is unlikely to result in their exit from the network and unlikely to trigger a cascade of exiting users. The authors concluded that the “cause of death” was due to declining cost-benefit ratios experienced by users as a result of the technical problems and site redesign. However, it was exacerbated by the network structure. So, the key point here is that the resilience of the network is determined by the number of connections that each person in the network has. So for any given network, the proportion of the network containing a certain number of friends fraction of the network with a certain number of friends with few connections can be a crucial indicator of the network’s overall resilience from cascades. In ecology, food webs are “networks” that describe a biological community in terms of the interactions between consumers and resources. The interactions are modeled as connections between consumers and resources that relate to the represent the transfer of energy and matter between the two. The interactions are diagrammed as lines connecting the consumers and their resources – which could be predators and prey, herbivores and plants, plants and soil, etc. What’s interesting about the Friendster article is its very strong parallel to ecological systems like food webs. Both social networks and food webs need many connections for stability and resilience. Like Friendster, food webs with few participants are highly vulnerable to collapse or sudden radical changes in their structure (called a “trophic cascade“), in which the loss or addition of one or more key participants effectively changes the entire food web by altering key links between network participants. (For example, it’s impossible to play the Kevin Bacon game if he were not part of the network). For social networks, the key to stability is each person having many Friends so that the loss of any single friend from the network is buffered by the many connections that each person has with other friends. For food webs, stability comes from a similar structure: they need many participants in the food web (the network) to create many different pathways between resources. Having many participants requires preserving biodiversity. If the biodiversity of a system is altered too much by the loss of a top predator or the introduction of an invasive species, the “network” can change. When this happens, vital connections between species can be broken and other connections can arise when newly introduced species competes for the same resources that were formerly linked only to native species. If the network does not contain many participants and has few connections, even small changes in the network will have drastic effects – in the worst case, it can result in a trophic cascade, such as the one that “killed” Friendster. As part of my PhD research at the University of Arizona where I study biogeography, biodiversity and macroecology, I have been part of a group looking at large-scale biodiversity questions for New World plants. In this role, I have been responsible for generating many species distribution models using Stephen Phillip’s Maxent software (and R with the Dismo package). I also use ArcGIS quite often to prepare environmental data for Maxent modeling, and wanted a way to perform and integrate Maxent modeling into my ArcGIS workflows. When working with data and analysis, my rule is that if I have to do something complicated more than twice, it’s generally worth it to develop an automated workflow. So for my species distribution modeling needs, I wanted a Maxent script tool that I could use as a standalone geoprocessing tool or embed within a ModelBuilder model for use more complicated workflows. For example, one of my most common workflow is iterating through a list of species and running a species distribution model for each one. To accomplish this, I wrote an ArcGIS script tool in Python that collects a variety of common Maxent parameters in a typical ArcGIS geoprocessing user interface and populates a command string to execute Stephen Phillip’s maxent.jar Java application via a Python call to execute a system command. The resulting script tool uses the arcpy model, so it works like any other ArcGIS geoprocessing script tool. 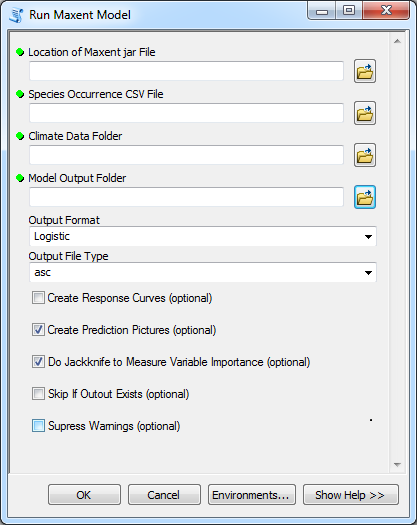 It can operate as a standalone tool to generate a species distribution model for a single species, or can be placed into a ModelBuilder workflow and linked to input parameters as shown in the example below. In this example, the script tool is parameterized with a species occurrence dataset obtained from the iterator object in which each dataset is named genus_species.csv. 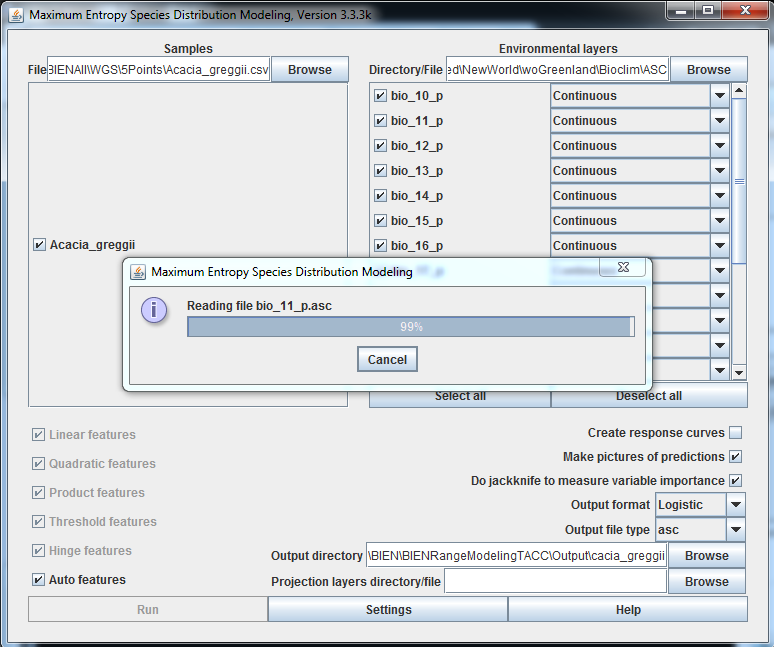 The tool then generates a species distribution model for each species and saves the model to a separate directory within a designated output directory, naming each directory by the genus and species name specified in the name of the input occurrence dataset. 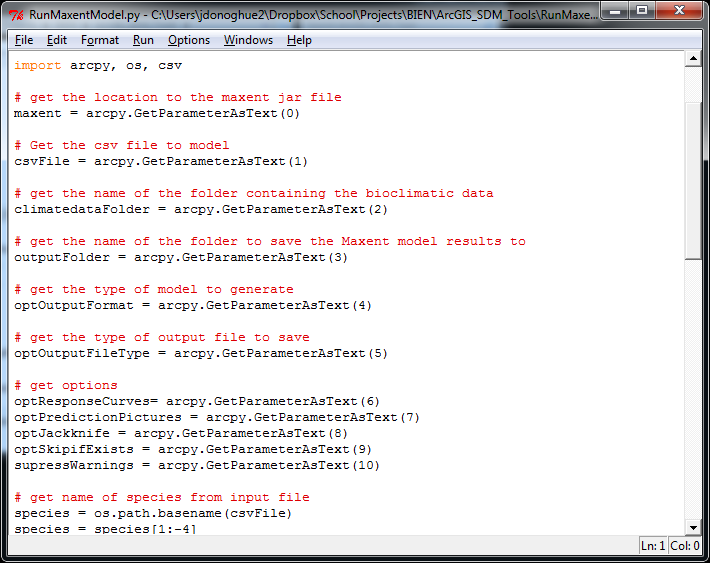 A partial example of the Python script that obtains the parameters from the input datasets is shown below. myCommand = "java -mx512m -jar \"" + maxent + "\" -e \"" + climatedataFolder + "\""
myCommand += " -s \"" + csvFile + "\" -o \"" + newOutputFolder + "\""
Of course there are some additional script lines that are not shown in the examples above add other maxent parameters to the command string and evaluate the result of the os.system call to determine whether the command executed correctly or not. However, I have placed a copy of a simple ArcGIS Toolbox and the associated Python script in a zipfile that you can download for your own modeling uses at the link below. 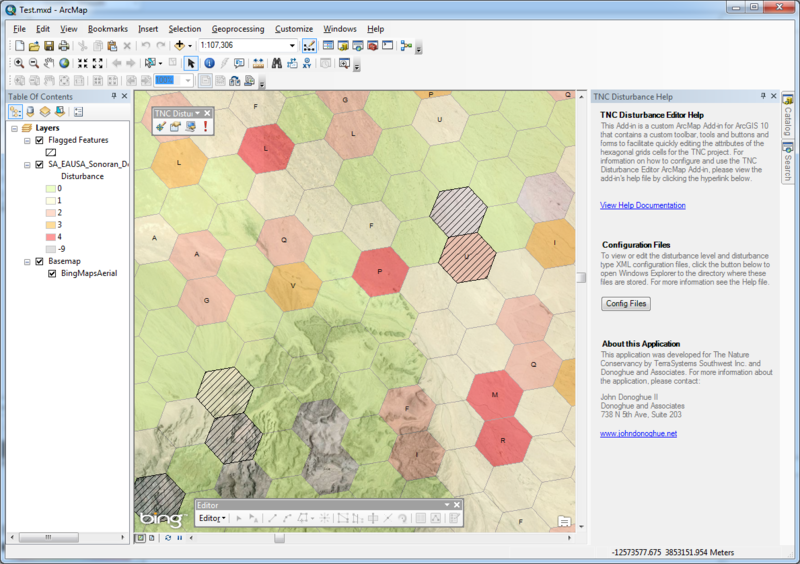 There are different versions for each version of ArcGIS you may be using. 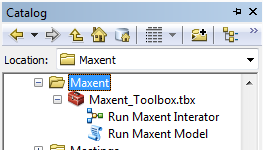 While newer versions of ArcGIS can read older toolboxes, older versions of ArcGIS cannot read newer toolboxes. So be sure to download the file below that is most appropriate for your ArcGIS version. If you like the tool, please let me know if you have any questions or comments/ideas. This is a fairly simple first implementation that I built to get through a lot of modeling quickly. However, I have a few ideas for additions to the tool that would enable it to handle species occurrence point data directly (instead of using saved CSVs) and perhaps leverage Maxent cache (.mxe) files instead of using the environmental data ASC files for each model iteration. At the moment, I’m too busy to add these, but it may be something I add in the future to round out the tool better. Note: This post is a 2013 update to my earlier post on Learning GIS and Getting a GIS Job – Some Tips and Tricks which was originally posted in 2009. In 2009 I wrote a post on how to obtain a GIS job that focused on pathways to learn GIS, critical skills every GIS analyst should know and ways to augment traditional learning pathways to set you apart from other job candidates. Even though this post is well over 3 years old, it’s still read by people interested in the topic and I still receive comments. I recently re-read the post and decided that an update was in order. Software has changed and old skills need to be replaced with new skills to keep up with the evolving GIS software industry. For brevity, I’ve focused this new post on changes and revisions to the recommendations I made in my earlier post. I’ve also added links to resources and elaborated on some topics I introduced last time. So, please be sure to read that post before this one so you have the complete picture for what’s changed. For simplicity, I’ve focused on skills needed for a GIS Analyst/Specialist position. GIS developers and GIS database manager positions have a different set of skills that may overlap with some of these, but also include specific skills that are not part of the everyday toolkit of GIS Analysts and are not included here. There are a variety of reasons why you want to learn GIS. You may be employed in a non-GIS field and are learning GIS as part of your job. Maybe you are switching careers or retraining yourself to find a new job in the growing geospatial industry. Perhaps you are a student who wants to learn GIS to support your field of study, or you are a student majoring in GIS or geography with aspirations of landing a job doing GIS. If you want to obtain a bachelor’s or master’s degree majoring in GIS or geography, you should start at a community college or university where you can take accredited GIS courses that will apply to your major’s requirements. If you’re seeking GIS skills for your current job or want to re-tool yourself for immediate employment, you may be better served by finding a professional certificate program in GIS at a local community college or university extension. These programs are usually non-accredited, which means that they will not likely count towards satisfying the requirements for a formal degree in GIS, but they are a great way to learn GIS quickly and gain readily employable skills to help you enter the marketplace. In addition, many professional certificate programs are taught by professionals working in the field, so you will get first-hand information about how GIS is used by the people who use it daily. These programs are also fantastic places to network with potential future employers. This list is by no means complete, so if you know of other programs not listed, please add them as a comment to this post. There are also a number of specific free short-courses and technical workshops available on the ESRI Virtual Campus website. Do not necessarily trust that your GIS certificate or degree program will teach you all the skills you need to know to land a GIS job. I’ve interviewed too many candidates who graduated from a GIS certificate program but only knew how to operate ArcGIS. While proficiency with ArcGIS is a critical skillset to have as a GIS analyst, there are a number of other hard and soft skills/techniques you should know to be a worthy job candidate. Microsoft Office (Excel, Word, Outlook, PowerPoint and Access). Finally, most job advertisements also require GIS Analysts to have a Bachelor’s degree in Geography, Geographic Information Systems (GIS), Cartography, Computer Science or a related discipline. (Related disciplines can be landscape architecture, urban planning, geology, etc.). In many cases employers will accept a degree in an unrelated field with evidence of completion of a GIS certification program or demonstrable experience with GIS. While GIS technician positions often require very minimal years of experience, it’s typical to see employers require at least 3 years of GIS experience for GIS Analysts. However, don’t let these numbers dissuade you from applying for any position. In most cases these are “desired” qualifications for a “perfect” candidate. “Perfect” candidates are rare, so employers frequently accept lesser qualified candidates, and it’s here that you can shine with your experience and skills. Are able to communicate complex GIS concepts to entry level users. Domain expertise, don’t just be a GIS jockey, know how to apply it to some government or industry such as environmental analysis, utilities, planning and urban development, marketing, etc. Whatever your interest, learn how to use GIS in your area. It will make you a more valuable and interesting person than just someone who knows how to use ArcGIS. I said this in my earlier post, but I’ll say it again because it’s important: Virtually everyone I know working in GIS got their first or subsequent job as a result of networking at a local or regional user group. Find one and attend them often. Ask questions, talk to people – these are (or will be) your colleagues and peers. If there isn’t a local or regional User Group in your area, start one. There are probably lots of GIS people working in your area that would love to attend a user group. This is a great way to make contacts in the GIS industry very quickly. Many agencies can get the use of their meeting rooms for free. Most local vendors will jump at the chance to market their product to a room full of potential customers, so vendors can be helpful in filling presentation slots and getting the word out. With a little bit of tact you can usually get a vendor to sponsor snacks if they are presenting. In my earlier post I mentioned the need to get real-world experience to set you apart from other job candidates who only have GIS classwork experience. Today, more schools are integrating GIS into their curricula, and more schools offer GIS courses and certificates than they did a few years ago. This means there are potentially more people competing for a GIS job with you, so what will set you apart from the others is your experience. So get real-world experience, read what I wrote in my earlier post as it’s important to develop real-world skills that will set you apart from your competition. In addition, build a portfolio of your work that you can take to interviews. My first portfolio consisted of printed 8.5 x 11 copies of maps that I had made, scripts I had written, and reports or documents I had developed. I placed these items in clear plastic sleeves made for a 3-hole binder and brought the binder with me to interviews. Later I made PDFs of my maps, reports and scripts and burned them to CDs that I would give to potential employers when interviewing – but I still brought my binder so I could show these items during the interview. So create a portfolio and bring it with you to interviews. It provides a great way to show off your discuss your experience and show off your cartographic skills. These will set you apart from most of the competition that will just show up to an interview with a copy of their resume. These days everyone applying for a GIS job can use ArcGIS Desktop. Sorry but that skill alone doesn’t make you special anymore (it doesn’t make me special anymore either). So potential employers are going to be asking what else you can do. 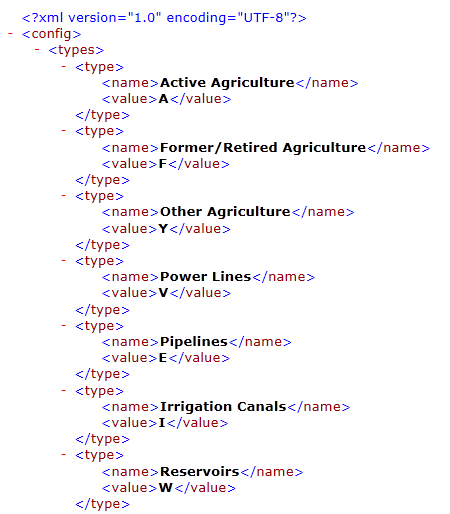 Any GIS person worth their salt knows how to set up and manage a database. Whether it’s Microsoft Access, SQL Server, Oracle, MySQL, or PostGreSQL, if you don’t know how to use a database, learn to. If you are not familiar with databases, then learn Microsoft Access. It’s a good database system that’s easy to learn and use. Plus many organizations commonly use it and many people already have it on their computers – as it comes with many versions of Microsoft Office. There are many actions we routinely perform in GIS which can be manually repetitive. Consider the example where you are given a disk with 100 shapefiles that are in the WGS84 projection and you need to import them into your GIS data library (a geodatabase). To do this you’ll need to re-project them to the coordinate system you use (NAD 83, UTM Zone 11). You could do this manually in ArcCatalog or ArcMap but it would be better to construct a workflow that could automate the process and do it 100 times. Model Builder is perfect for this kind of task. 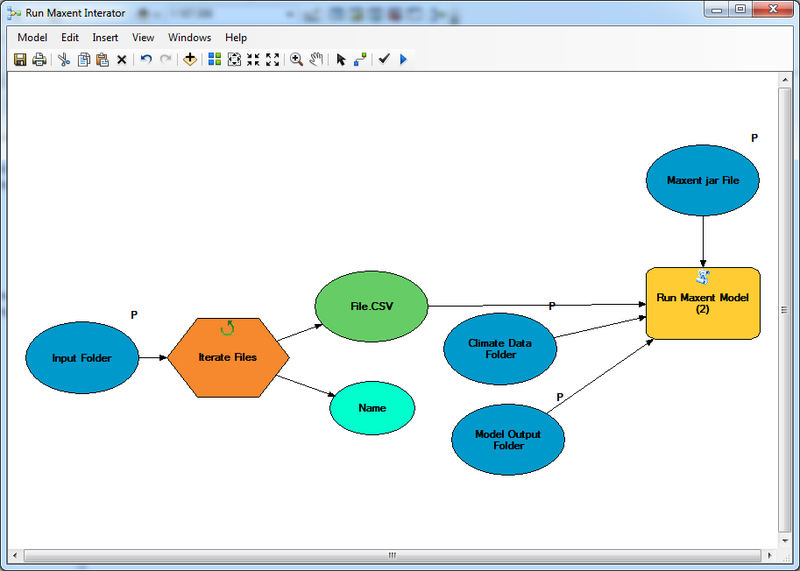 ModelBuilder is an application you use to create, edit, and manage workflows that string together sequences of geoprocessing tools, in which the tools feed the output of one tool into another tool as input. ModelBuilder is a visual programming language for building these workflows. Performing actions like manually importing 100 shapefiles is tedious and not a good use of your time. Complicated analyses often require a lot of geoprocessing actions and you’ll often find that you may need to repeat an analysis. If you need to run a complex analysis again and you didn’t build a model, you’ll have to re-do all your geoprocessing tasks manually and hope you took really good notes of your processing steps. If you’re working with large datasets, geoprocessing tasks can take a long time. In this case, it’s best to construct a model to perform these tasks after hours instead of doing each task step by step (by hand) and waiting long periods for the output. Models can be incorporated into ArcGIS Toolboxes and easily distributed to other users so they can quickly repeat an analysis. Models can be uploaded to ArGIS Servers to enable processing of files on a server or in the cloud. Finally, savvy employers know about Model Builder and it shows up as either a required or desired skill in job advertisements. If you are going after a GIS job in a large organization with an existing GIS program, there’s a chance that you’ll be asked about your experience with ESRI’s ArcGIS Server product. ArcGIS Server is a web server application that allows you to share GIS resources (maps, globes, tools, geoprocessing workflows, etc.) over the web. These resources are hosted on the ArcGIS Serve to facilitate sharing data that is centrally managed, supports multiple users, and contains the most up-to-date information. ArcGIS Server skills are in demand these days and it’s a key skill to learn if you can. However, learning ArcGIS Server isn’t easy. Installing, managing and operating ArcGIS Server requires knowing a little about how to manage a file server and web server and active directory permissions. Realistically the best way to learn about ArcGIS Server is to take a class. Many in-person and online programs offer a course in ArcGIS Server; ESRI’s Virtual Campus has courses in ArcGIS Server as well. If you’re not familiar with ArcGIS Server, visit the links below to get a general introduction to ArcGIS Server and its capabilities. If you can’t get experience working with ArcGIS Server, one thing you can do (in addition to reviewing the links above) is to register for a free personal account on www.arcgis.com. 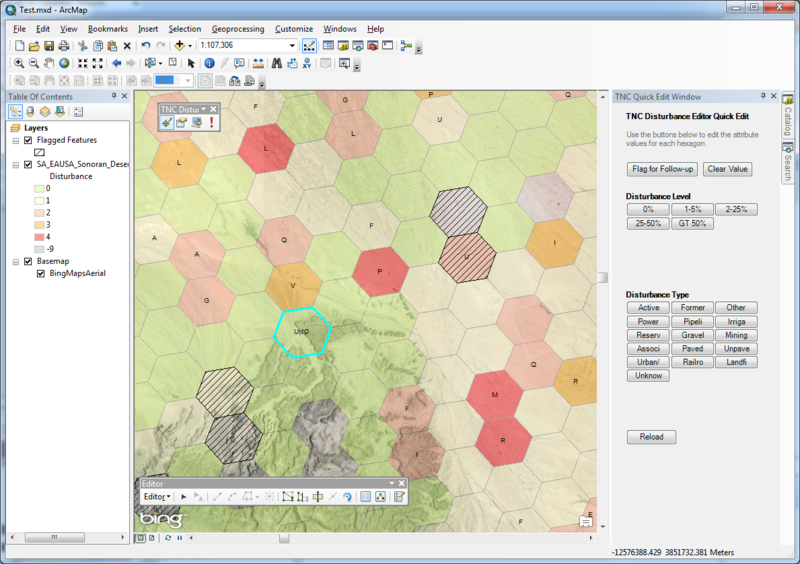 ArcGIS.com is a subscription based online platform for sharing geographic information and maps. ESRI offers a free personal account that provides limited access to features and 2 GB of storage space. With this account and a copy of ArcGIS you can upload data and maps to ArcGIS.com and experience a little bit of what it’s like to work with an ArcGIS Server from a user perspective. Yeah, it’s not and ESRI product, but Microsoft Excel can be a critical component of your data scrubbing workflow. I use it often to view, manipulate and clean data before I import it into ArcGIS because it’s powerful, fast and can be used to make many data changes quickly and easily. When learning GIS, we work with prepared datasets that have been cleaned and optimized to work in our exercises with minimal issues. In the real-world, data is messy; it contains a mixture of values in a variety of formats. Knowing how to quickly clean up a dataset is an essential GIS skill. So I use excel to change data from UPPERCASE to lowercase to replace portions of data with other values, to trim data, and to combine and split data. However, I rarely make these changes manually. Instead I use powerful functions in Excel that automate these corrections across rows and columns. In my earlier post I recommended learning a scripting language because knowing how to write a script comes in handy when you need to scrub huge databases or perform actions like correcting addresses for better geocoding accuracy, reformatting data, exporting and importing large datasets, and other manually repetitive activities GIS people are routinely tasked with. Back in 2009, I suggested that Visual Basic for Applications (VBA) was a good way to get started. Since that post ESRI has deprecated support for VBA in ArcGIS 10.x and VBA is not the preferred way to script in their latest product lines. In my previous post, I wrote about the virtues of learning Crystal Reports. Crystal Reports is a powerful reporting tool that can read databases and spreadsheets, perform queries, sort and summarize data and generate professional looking PDF or live reports. Crystal Reports used to be included with ArcGIS Desktop, however at ArcGIS 9.3, ESRI stopped including the full Crystal Reports product; and the Crystal Reports Wizard is no longer included in ArcGIS 10.x. As a replacement, ESRI now offers a reporting application built into ArcGIS Desktop that provides much of the same functionality that Crystal Reports offered. However the reporting application cannot be accessed or used outside of ArcGIS Desktop and must be used from the ArcGIS Desktop user interface. You may be wondering whether it is still important to learn Reports for ArcGIS. Yes, because it’s not always about the map; in fact, it often isn’t about a map at all. I know us GIS people got into GIS because we like to make great looking maps, but the mistake we make is thinking that everyone else likes maps too. When I started working in government GIS, I was amazed at how often I was asked to create a report showing the results of my analyses (for example, a report containing a table summarizing the number of acres of different vegetation types that will be impacted by a proposed development). No map; no polygons on a nice aerial photo – just a table of numbers representing the results of a geographic analysis. There was still a lot of cool GIS analysis that went into generating the report, but the end product wasn’t a map. While I’ve written this post within the context of obtaining skills you need to land a GIS job, these are equally appropriate skills for those already employed in GIS. The industry continues to change rapidly, and you can get rusty pretty fast if you’re not keeping up. Each new software version brings new features that offer new opportunities for learning a new skill or adding to our existing knowledge base. For example, I recently learned how to write and deploy ArcObjects applications in ESRI’s new ad-in framework and plan to learn how to use the new Python ad-in framework in ArcGIS 10.1. Learning these employable GIS skills is also a very good investment. GIS jobs are still ranked very high in job growth outlook – the Bureau of Labor Statistics lists an expected 35% growth in jobs for “Geographers” (http://www.bls.gov/ooh/life-physical-and-social-science/geographers.htm). Whether you’re looking for your first GIS job or looking to move to a new organization, these skills will make you much more marketable than your typical competition. Finally, I’ve tried to identify those skills that I view as important for obtaining and maintaining a GIS position. I’ve also focused on skills a GIS Analyst or Specialist should know. If you’ve read this and can think of other important skills I didn’t mention, please leave a comment to benefit the larger community. In the opening scene of the new Les Miserables movie, Jean Valjean (played by Hugh Jackman) is one of many shackled prisoners trying pulling a large ship into a dry dock during rough seas. The work song, “Look down, look down” is quite dramatic and the whole scene is cinematically spectacular and a powerful opening to a great film. After reading the latest edition of PhD Comics’ parody of Les Miserables, I thought back to the opening scene in the movie and the prisoner work song. The song’s parallels with PhD student life were striking. Thus, in the sprit of the the PhD Comics parody, I present a PhD student version of “Look down, look down”. Apologies to Victor Hugo, and all musical productions of Les Miserables. You’ll have to stay T.A.